The Eagles (below) won the Sunflower League title and closed out an undefeated regular season for the first time since 2004. After five years of ups and downs Olathe North is once again a heavy favorite to win a state championship. The Chesty Lions had one of their worst seasons in school history, but were able to aviod a winless season with an overtime victory against Leavenworth. For that reason alone the Chesty Lions get a thumbs up for the week. Overall the Sunflower League did well, qualifying for six of a potential eight playoff positions in the Class 6A playoff bracket, including the top three seeds. At one point in the season the Falcons stood at an impressive 4-2, but the team took a nosedive in district play. Olathe South's three losses to end the season will leave the program with a nasty taste in it's mouth during the offseason. Olathe South's three losses seem bad, but pale in comparison to the Indian's seven straight. The problem with all the losses was that SM North never appeared to be that bad of a team. They just never seemed to get any lucky breaks when it really mattered. For now it looks like the two game explosion was more a product of the opponents than the Olathe Northwest talent. The team received a reality check at the hands of Free State this past weekend, and it will take alot for the team to bounce back against Blue Valley Northwest. 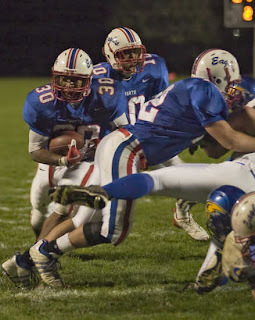 **Olathe North's James Franklin eclipsed 5,000 career rushing yards with a 20 carry 168 yard game on Friday. He also added two touchdowns and now has 1,927 rushing yards and 25 touchdowns on the season. 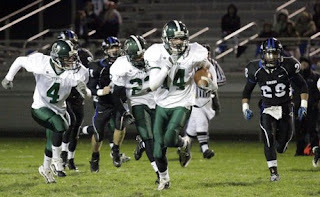 **Lawrence Free State's Kirk Resseguie rushed for 182 yards and a touchdown in his team's victory. Resseguie has gone from relative obscurity being one of the league's top backs in the course of one season--quite an impressive feat. **In his last high school game SM Northwest's John Hauk battered SM North for 221 rushing yards and two touchdowns on 36 carries. **SM West running back Will Livingston score three rushing touchdowns for SM West, and ultimately broke SM East's upset chances on a 90 yard touchdown run in the fourth quarter. **Lawrence Free State's Keene Niemack (below) scored three touchdowns via three different methods. He had an 86 yard kickoff return for a touchdown, a 16 yard touchdown run, and caught an eight yard touchdown pass. 1. Olathe North (9-0): The Eagles took the outright Sunflower League crown and look primed for a title run. 2. Lawrence Free State (7-2): Last year's playoff run is still fresh on the Firebird's minds. 3. SM West (8-1): The Viking's defense has been tops in the league and will be key in the teams's matchup with the high powered Blue Valley offense this Friday. 4. Olathe East (6-3): The Hawks have now qualified for the 6A state playoffs eight straight years. 5. 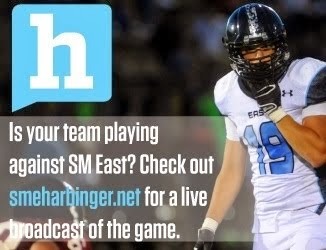 SM East (4-5): SM East is quickly losing their "Smurf" image and this year's playoff berth is promising for the program. 6. SM Northwest (5-4): The Cougars inconsistancies got the best of them in the end, but they were still one of the better teams in the Sunflower League. 7. Olathe South (4-5): The Cardiac Kids couldn't put it all together this season; the one thing we do know is that Jeff Gourley's aerial attack is steadily improving within the program. 8. Olathe Northwest (4-5): The Raven's still can't manage to win big games; they have a chance to change that image this week against the one-loss Blue Valley Northwest Huskies. 9. SM South (3-6): The Raiders of 2009 were definitely the best team Brandon Claypool has put together thus far as the head coach at SM South. 10. SM North (2-7): How good, or bad were the Indians in 2009? It's hard to say, but at least they took care of business against the two opponents they should have beat. 11. Lawrence (1-8): A collective sigh from LHS alumni could be heard around Lawrence, KS after the Chesty Lions punched in their game winning touchdown in overtime. 12. Leavenworth (0-9): Leavenworth finished without a win, but their last loss to Lawrence could have gone either way.